Complex variation of the East African climate may have played a key role in the development of our human ancestors. Scientists have identified extensive lake systems which formed and disappeared in East Africa between one and three million years ago. The lakes could be evidence that global climate changes occured throughout this pivotal period in human evolution. The findings, reported in the journal Science, suggest that humans evolved in response to a variable climate. Dr Martin Trauth of the University of Potsdam and his team were able to identify and date the prehistoric lakes by studying layers of soil along the Rift Valley in Kenya, Ethiopia, and Tanzania. 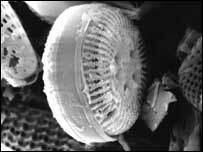 Layers containing microscopic algae skeletons, called diatoms, reveal the depth and composition of the ancient lakes. Volcanic ash in nearby layers provides an estimate of the lakes' ages. Radioactive elements in the ash act as time stamps because they decay in a predictable way with time. By examining soil layers at seven sites throughout East Africa, Dr Trauth and his collaborators were able to identify three distinct periods during which extensive lakes covered the region and grew to depths of hundreds of metres. They argue that the growth of these lakes resulted from a moist local climate. The regional wet periods, which may have persisted for up to 100,000 years, occured as much of Africa became increasingly dry. The periods of wet weather in East Africa might reflect fluctuations of the Earth's climate as a whole. At the time when the lakes grew - roughly 2.6, 1.8, and 1 million years ago - glaciers and the atmosphere were also going through major transformations. The Science paper states that if the lakes were temporary features related to the global climate, as the data suggest, they provide strong support for theories in which early human species evolved and spread out in response to a rapidly changing environment. "These episodes could have had important impacts on the speciation and dispersal of mammals and hominins," the researchers write. Chris Stringer, a leading researcher on early humans in the department of palaeontology at London's Natural History Museum, praised the quality of the data, saying that it provides "very good evidence" of climate change in East Africa. However, he stressed that more detailed work was necessary to positively link these environmental changes to the emergence of man. "What this is showing is that there are fluctuations of the climatic belts moving up and down," he said. "But if early humans are able to move around, the effect of varying environment is reduced. The key issue now is how mobile are these people?"